In Sailing, what is Gybing? 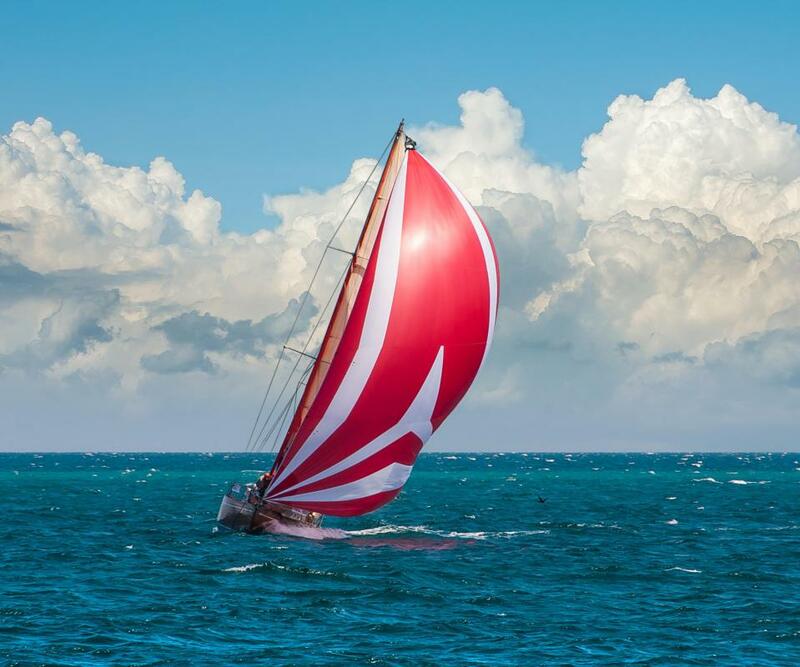 A sailboat is said to be gybing when it is running from the wind and alters its course so that the wind starts to come across its stern and hit the sails from the opposite side. In sailing, different sail trims, or adjustments, are necessary in order to move the boat from one point to another. Whenever a sailboat needs to progress in a direction heading away from the wind, the operation necessary to keep the stern (rear) turning through the wind and alternately filling the sails from one side and then the other, is called gybing (or jibing). This maneuver results in speed and power because the sails are continuously with the wind throughout the operation. Gybing may begin when a sailboat is on a run (running). Running means the boat is moving with the wind. Gybing means it is running on either a port side or starboard side run. If the wind is blowing from off the left side of the boat to glance against the left side of the sail, the boat is said to be on a port (left) tack run. If the reverse is true, it is said to be on a starboard (right) tack run. Gybing refers to the maneuver of changing from one side to the other. To accomplish this, it is first important to determine there is enough room to safely change direction. If there is sufficient space for the maneuver, the helmsman (person steering the boat) will call out, “Ready to gybe!” When the mate (crewman) is in position and ready to respond, he or she replies, “Ready!” Upon hearing this, the helmsman will move the stern in the opposite direction through use of the rudder. As the turn progresses, the stern will move through the wind and the sail will move away from its current best position of harnessing the wind direction to a new position wherein the sail will fill from the other side. The mate will tighten sail as required. Unlike maneuvers done while sailing into the wind, gybing will not cause any sails to luff, or flap, too much since the vessel is moving in line with the wind. However, at this point some very important things must occur simultaneously. The boom -- horizontal beam connected to main mast -- will swing from one side of the boat to the other. Sailors have been caught unawares by such rapid movement and have ended up injured or overboard. Therefore, it is essential to duck out of the path of the swinging boom. As the helmsman continues to turn through the wind, the mate begins loosening sail to fill from the opposite side. The helmsman and crew must shift their position to sit on the other side of the boat. As the helmsman continues steering the new course, the mate trims (adjusts) the sail for maximum fill, completing the gybing maneuver. How Do I Become a Sailing Instructor? What is a Day Sailer?